A lace front piece or lace frontal is attached in the front hairline in the same fashion as a full lace wig using adhesive, bond, glue or tape. 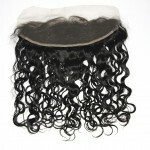 The rear of the lace front piece must be blended into the existing hair and held in place with an attachment. 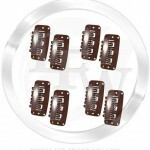 Many women prefer lace front weaves for the attachment of choice but hair clips, tape, bond or glue can be used to secure the back of the lace frontal into their own hair. A lace front weave is a method of attachment whereby the hair stylist makes a braid in the hair on the scalp and the back of the lace frontal is sewn into the weave or braid for a secure hold. Many women who purchase the lace frontals also purchase our hair weaves to use in the back of their heads for uniformity and the same consistency. Will a Lace Frontal look as natural as a full lace wig? A lace frontal is constructed the same way as the front of a full lace wig. 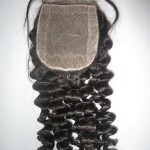 Our in stock lace frontals come with fine French lace, top grade Indian remy hair, single strand by strand construction, bleached knots, and baby hair for a natural looking hair line. 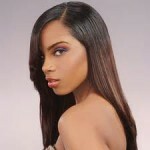 With combing and blending the lace frontal into your own existing hair, it can’t look more natural than that.